As much as I hate to see it go, summer is on its way out. Our bathing suits and beach towels are washed and stored. Jackets and jeans have come out of hiding. Apples are reappearing in our CSA box. And sadly, we harvested the last of our backyard tomatoes. I love tomatoes. I love them enough to avoid eating them out of season when they are pithy, tasteless and generally useless. So to honor the last of our tomatoes, I paired them with our backyard’s real bounty — serrano chilies. 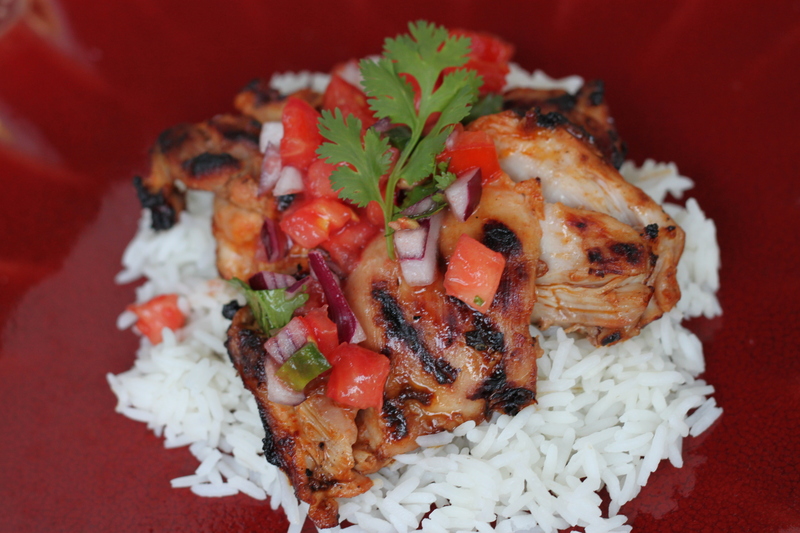 The tomatoes and chilies in the pico de gallo provide a nice acidity and heat for the savory grilled chicken thighs. It even livened up the plain white rice I served with it. Another note on peppers — we grew a bumper crop of hot (really hot) ones this year thanks to a new sunny garden bed and good weather. We obviously couldn’t eat a basket of hot peppers each week, so I made up a huge jar of homemade pickled serranos and jalapenos. If anyone else is looking for a way to preserve their own peppers, check out this fabulous recipe from David Lebovitz for pickled jalapenos. Delicious, easy, and perfect for topping nachos. Prepare your grill for cooking over direct heat with medium‐hot charcoal (moderate heat for gas). While the coals are lighting, stir together the lime juice, oil, minced chipotle, and salt in a liquid‐measuring cup. Put the chicken in a large sealable bag and add 1/3 cup (80 ml) marinade (reserve the remainder in a cup). Seal the bag, forcing out excess air, and marinate the chicken at room temperature for about 15 minutes. Stir the honey into the remaining marinade until dissolved to make a sauce. Grill the chicken (discarding the marinade in the bag) on a lightly oiled grill rack, covered only if using a gas grill, turning the chicken over occasionally and moving it to avoid flare‐ups if necessary, until just cooked through, 8 to 10 minutes total. Brush both sides of the chicken with some of the reserved sauce, then continue to grill, turning over once, until lightly browned, about 1 minute more. Serve the chicken drizzled with remaining sauce and topped with pico de gallo, if desired. Place the onion in a colander and rinse under cold water, then drain. Gently mix together all of the ingredients, including the onion, in a medium bowl. Taste and add more lime juice, salt and/or pepper, if necessary. Serve with tortilla chips or as a topping to meat, fish, or poultry.